In life, there are many different roads you can take. But not many of those paths will let you soar through the sky, high above the gravel, asphalt, and dirt roads that everyone else takes. 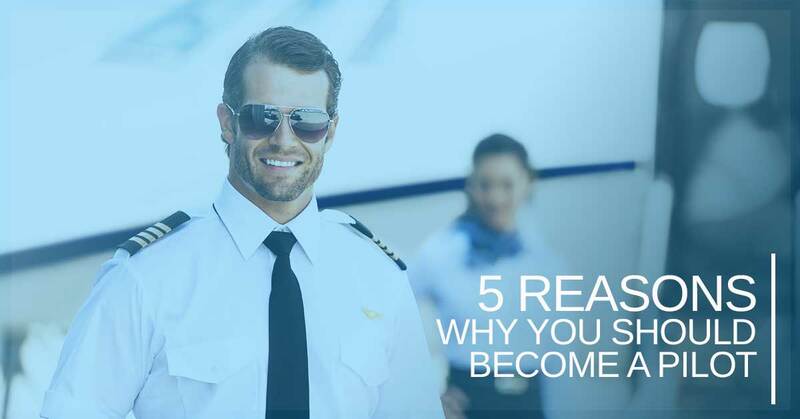 In fact, there’s only one career which allows you to experience that type of thrill and satisfaction: becoming a commercial airline pilot. As a pilot, you’ll be able to live out your passion for flight, which is something not many people get to experience in their lifetime. Sure, it can be difficult, tedious, and downright time-consuming. Sure, becoming a pilot requires patience, strength, a steady hand, and great decision making on-the-fly. But boy, is this career rewarding. If you’re contemplating what you want to do with your passion for flight, you should consider becoming a pilot. Here are just five reasons why. As a pilot, you are responsible for one of the most powerful and fascinating pieces of machinery. There are lots of intricacies involved with operating and flying a plane, particularly a commercial airliner, which means you have to be well-qualified and well-prepared. Flying will teach you things you never thought you’d know, and you’ll learn how to make snap decisions, plan for the unexpected, and even how to read weather patterns. Flying a plane requires patience, proper management of resources, and a unique perspective on the magnitude of your job. There’s nothing quite like flying to teach you all about these things. Think about the items on your bucket list. Chances are, traveling the world is one of the top two or three items on that list. As a commercial airline pilot, you have a rare and unique opportunity to do just that, in a way that few people get to experience. As a pilot, you could be making stops in multiple states, or even countries, in the span of 24 hours. No other career allows you to log this many miles, or stamps in your passport, in such a way. As a pilot, especially with the proper type rating training, you have access to rewarding and lucrative career opportunities. There’s nothing quite like flying for a living, and being able to get paid to do so is something that not many people can put on their resume. With both domestic and international flight travel always on the rise and in high demand, there will always be ample opportunities out there for qualified pilots. Flying through the sky at 30,000 feet above the ground gives you an advanced perspective on travel, life, and your role in it. As the steward responsible for transporting people from all walks of life across the country, or even across oceans, you gain an interesting awe-inspiring perspective. It truly is a privilege to be able to fly for a living. Wow. Just take a look at that view. You truly have no idea what you are missing until you are able to look at the Earth from high in the sky. It’s captivating, exhilarating, and downright magical to soar through the sky, kiss the clouds, and see the world below. Learn how to become a commercial airline pilot today with the help of Alliance Aviation. We can help you take flight with state-of-the-art type rating training, ATP-CTP training, and more. Give us a call or enroll in type rating training online to learn more.